(Beyonce’) There ain’t nothin out there. (Missy) Missy Elliot exclusive. I know one thang. Beyonce’ bet’ not answer this phone. Heard the ladies in free. I aint got no money either shoot. we ‘posed to been at the club. keep you in the house for another friday. Why he tryna keep you in? Why You still don’t wanna roll? (beyonce) cause I got my prize right here. 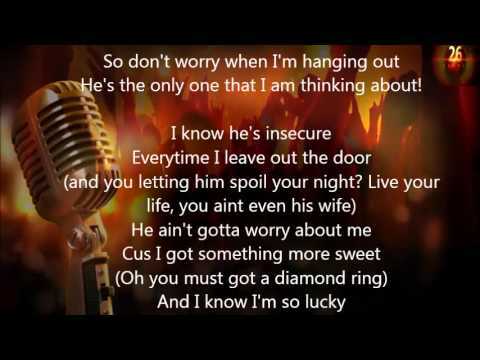 (beyonce’) There aint nothin out there for me. Aint nothin out there for me. and i aint came across nothin so sweet. and I dont need more than one. He’s the only one that I’m thinkin about. everytime I leave out the door. live your life, you aint even his wife. (missy) Oh you must got a diamond ring.